Quiltville's Quips & Snips!! : Galaxy-Gram! Time Out for Custard Cup! I have arrived in Illinois! 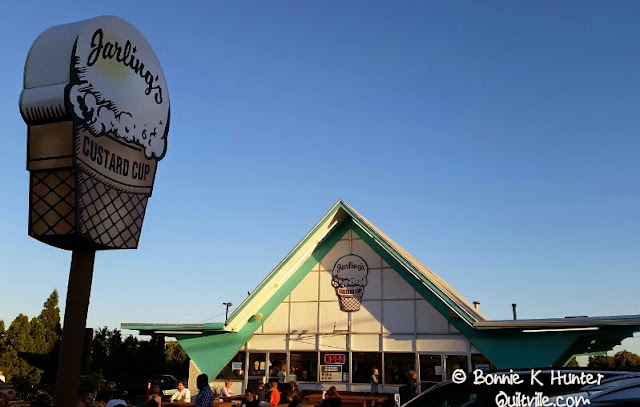 All bags are present and accounted for, dinner has been taken care of, and nothing finishes off a busy travel day like some local ice cream flavor. Jarling's custard cup is a standard affair in Champaign, Illinois, home of the Fighting Illini! Excited about the workshops that will happen this week, looking forward to meeting all of the quilters who are coming! Oh for a Custard Cup ice cream cone! I love their strawberry. Have a great time in the great state of Illinois. I'll have the coffee oreo please!! 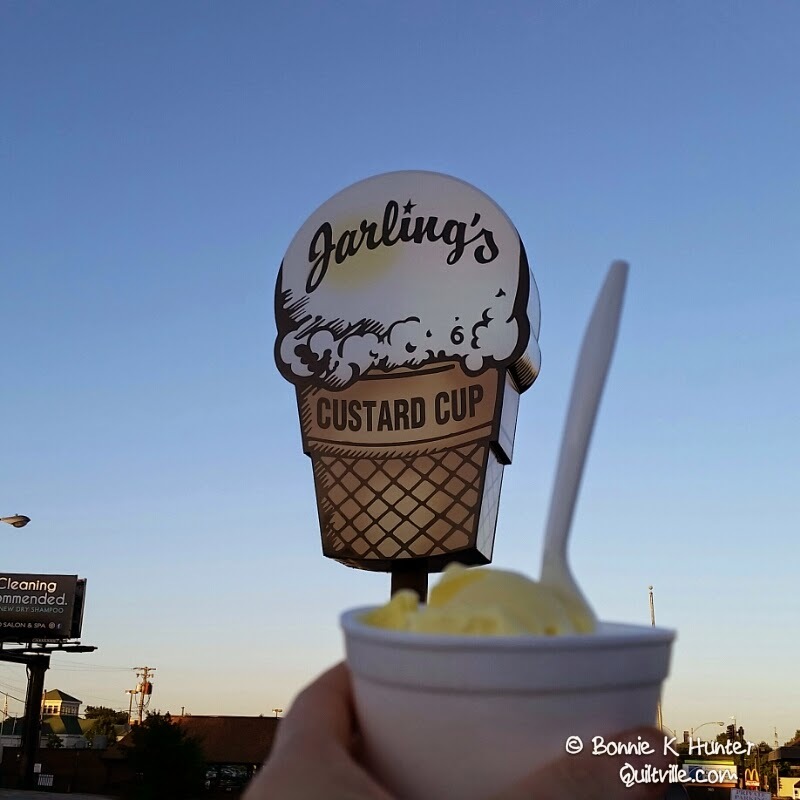 Karen, Custard Cup still has a stand in Danville! I had a great time tonight at supper! So Looking forward to the next few days of classes! Okay, now I want some lemon custard! My brother and I both went to U of I and neither of us has heard of this place. It's just west of the Assembly Hall on Florida/Kirby...about 1 block farther than Neil St. YUM! I will have some on Friday. oh my! How I miss Wisconsin frozen custard. Leon's in South Milwaukee was the best. There is nothing like it here in New England where we live now. How is Illinois? I made Orange Crush quilt top in hopes to make it home for your class however I am still here in Washington :( Thanks for all you do!! Ahhhh, The Custard Cup! Fond memories and just a couple of blocks from where I lived in Danville. 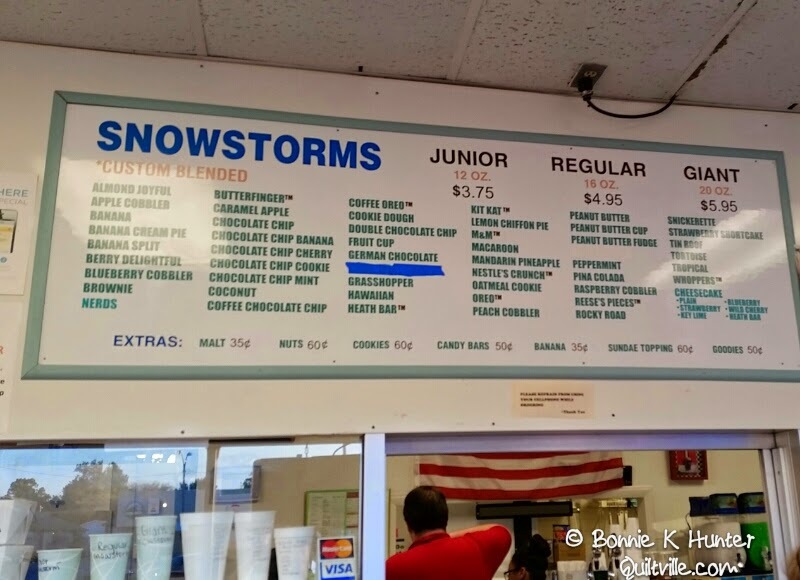 Gotta try the cold fudge sundae on either lemon or vanilla ---- to die for! Enjoy and have some for me. Oh, we love Jarlings. But, after living in Champaign 52 years, we moved to Alabama to be near our oldest daughter. Where and what are you teaching? Wish I could be there.